Michigan State University has continuously promised to hire new leadership from outside the university community. However, as of Thursday when the board appointed the new interim president, they didn't have to look far. EAST LANSING, Mich. — Michigan State University has continuously promised to hire new leadership from outside the university community. However, as of Thursday when the board appointed the new interim president, they didn't have to look far. 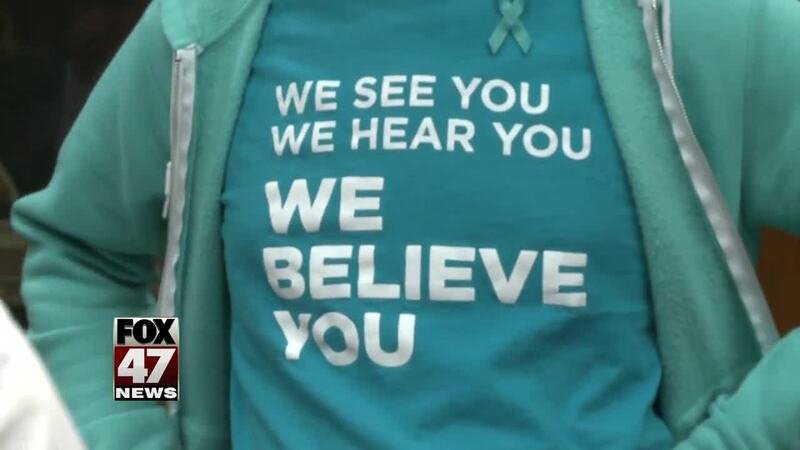 The teal ribbons and signs that are spread around campus show they are still trying to heal, and looking for the right person to help them do that. It was a split feeling at first with the community, but those FOX 47 News talked with Thursday are just happy to see John Engler out. When we asked the board if they still plan to do a nation-wide search for a permanent president they said, "I believe so I feel confident that we will have someone outside of the university with presidential search," said Brianna Scott, MSU Trustee. Some in the community say it doesn't matter that Satish Udpa is from MSU when it comes to this temporary role. "I think for an interim president it makes sense, especially at this short notice to have someone that is internal to MSU," said Anna Pegler-Gordon, an MSU Faculty member/Reclaim MSU. Not everybody felt that way. Disgraced former MSU doctor Larry Nassar survivor Kaylee Lorincz said it didn't sit well with her at first. However, after hearing sweeping support from the board of trustees, Lorincz said she has hope. "I couldn't be more grateful that he is now in this position. And I can't wait to see what he is going to do in the future,"
For the future, members of the MSU community are begging the university to step outside its borders to find a permanent president. And to include them in the process. "I think it's crucial that people actually get to see who those top candidates are and talk to them. No more secrecy, we can't afford that. That breeds power imbalances which breeds all different forms of violence, sexual and other forms of violence on campus," said Andaluna Borclia, an MSU Faculty member /Reclaim MSU. The university has been without a permanent leader since January 2018, when Lou Anna Simon resigned the community said they are hoping this will be the time to start finally healing.